Continuing with Gemstone Each Month Series (GEMS) – March for Auqamarine, we would be discussing about History behind Aquamarine and its uses. This cool blue fascinatingly beautiful gemstone has been extremely popular in history. 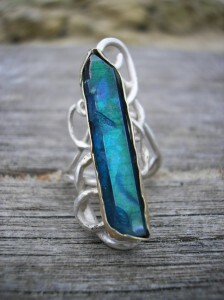 Also showcasing a very beautiful Aquamarine ring by one of our contributor Maura Nicholson. Talking about he history, Aquamarine was first mined in 1811 in Brazil. But according to some documented proofs the use of aquamarine gemstones exists between 480 and 300 BC. Greeks used aquamarine to make jewelry. Small opaque and translucent aquamarine rocks were used by pirates and sailors, who believed that it would protect them and ensure a safe journey. Coming to applications, Aquamarine generally occurs in large and flawless crystals. Its faceted into many cut and is used in jewelry for rings, earrings, necklaces, etc. Six-sided large crystals are worn as necklace pendants. Less common are translucent aquamarine, showing asterism and cat’s eye effect, these are mainly cut and polished into cabochons. So this was about the history and applications of Aquamarine, would be posting more about it soon. If you would like to share anything on this stone please email us at info@jewelstruck.com. Most Aquamarine on the market has been colour enhanced by heat treatment!